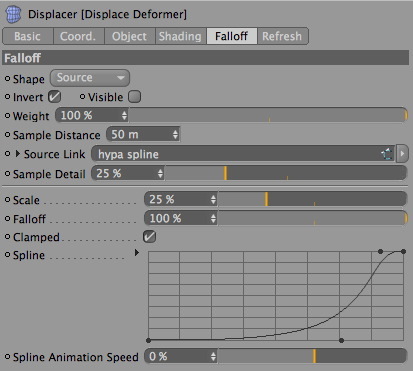 Did you know you can use splines to create displacement? You also need a spline of some kind. This will work with parametric splines too. Once you’ve set this up, then you need a shader or texture to displace. Hold on… I said you could displace using splines. Well this is true, but you still need a shader or material to drive the displacement. So the simplest thing to use is a pure white color shader. So add a color shader to the Shader slot in the Displace Deformer, Shading Tab. You could always use a different shader there later for some even more interesting results. Now it will displace the whole mesh exactly the same. You can adjust the Strength, Height, the Type of displacement and also the Direction in the Object Tab. Still doesn’t look very interesting does it? Here comes the fun part. Switch to the Falloff tab. Set the shape to Source. When you do this, the interface will change and you will have a link field. Drag and drop your spline into this link field. So now the white shader is displacing the mesh, but the spline is controlling the falloff of the displacement. So you can easily get results like this. Try adjusting the sample detail for some interesting results. You can also use a spline to adjust the shape of the falloff. Plus you can animate all these parameters, and of course the spline or mesh too! So really the results are limitless. Trying to achieve this using regular displacement with textures would surely be a much more complex and time consuming process. Here’s my sample file for you to download and enjoy Have fun! EDIT: The behaviour of this seems to be different if you are using r10.5, so here is a file that I made for 10.5 users that shows the functionality is still there. Although it seems to be slightly limited in comparison with r11. Download the 10.5 file for this scene. Ehi.. This is great, really nice one. thank you. I’m trying to duplicate this setup but I can’t get my file or your file to render as above. For me, having the min Y falloff value (leftmost point on the spline) at 0 eliminates the falloff altogether. I have to move the min point off the bottom to get any relief showing. None of the other points along the spline seems to have no effect on the falloff at all. Any thoughts? Something I have turned off? Yes, same trouble with your file as well. Just tried it again to be sure. Running 10.506. I checked in 10.5 and the behaviour is definitely different, it seems Maxon added functionality to this when r11 came out. However it still works with 10.5. If you right click on the spline in the AM and choose reset. Then fiddle with the scale and sample detail, you should see your spline create the displacement falloff. I’ve updated the post and added a 10.5 file that shows it working. Thanks for pointing that out and I hope the new file works for you now! Yep, that did the trick alright! Thanks Tim. Thanks for posting this. I was tearing my hair out trying to accomplish this with the Boole operator. This calculates sooo much faster. Great tip Tim! Thanks for sharing!